The Business Innovation Observatory (BIO) is a 3-years conference cycle around innovative trends in business and industry. 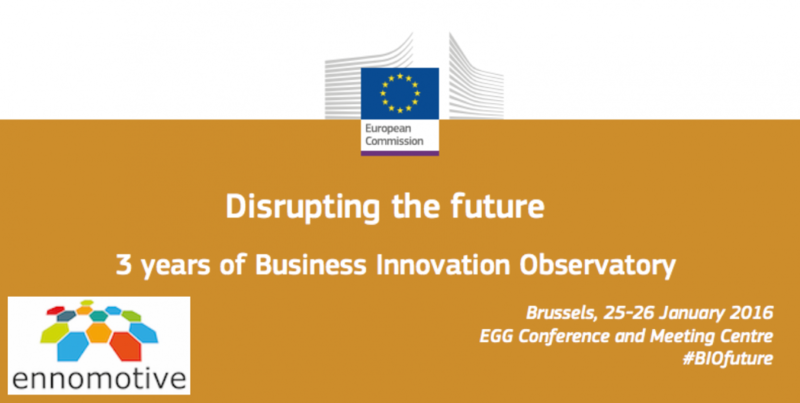 The sixth and last conference “Disrupting the future” will take place in Brussels on the 25th and 26th January. During the workshop, more than 150 participants will gather entrepreneurs, industry experts, policy makers… to discuss the latest trends from successful European innovative companies and to celebrate the new generation of European innovators. Ennomotive will be present in this workshop, presenting our business and how it contributes to shape a smart, sustainable and innovative future for Europe. Do you want to be part of the Ennomotive’s community? Join the most innovative community of engineers!